Tanaza just released a new feature: the bandwidth control on a per user-level. Tanaza already features the bandwidth management per SSID, which means that WiFi administrators can limit the total amount of bandwidth available for one SSID. Example: in a Hotel with only two guests. A WiFi administrator configures an SSID with a maximum bandwidth of 10 Mbps. If the first guest could use 7 Mbps, the second guest will only be able to use the 3 Mbps remaining. The bandwidth is not shared equally among WiFi users. What is the difference with the bandwidth control per user? The bandwidth control per user means that a network administrator can limit the amount of bandwidth one user can use on the WiFi network. The limit is set at the user level and not, at the global level (SSID). The capability to specify the bandwidth users can access will guarantee the same users’experience; the bandwidth is divided equally among WiFi users. 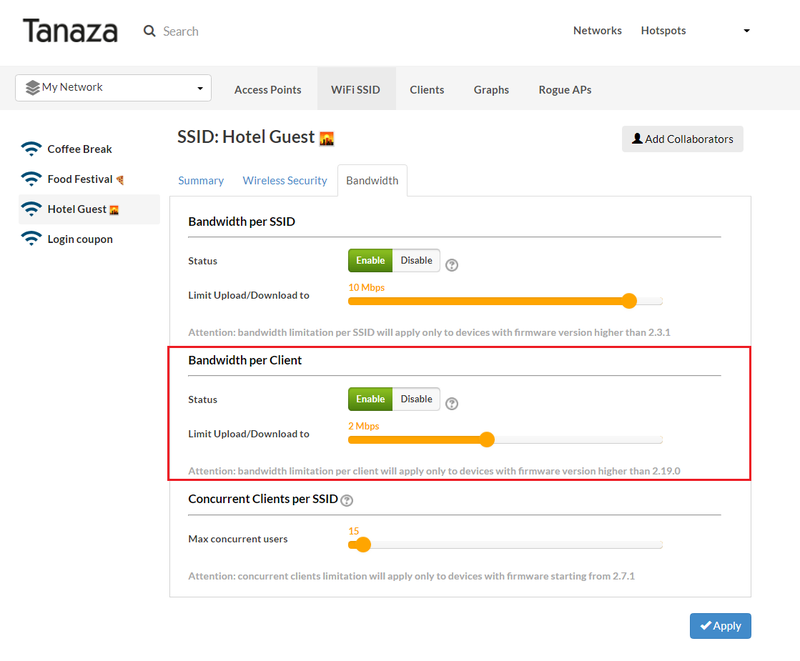 Also, Tanaza’s Bandwidth Control per Client feature comes with a “boost” function, which allows hotel guests to exceed the bandwidth limit for a few seconds when they use a WiFi service. Example: in a Hotel with only 5 guests. A WiFi administrator limits the bandwidth of the Hotel SSID at 10Mbps. Besides, he limits the bandwidth per WiFi users at 2Mbps. Each guest will have the possibility to use until 2Mbps while browsing. The bandwidth is shared equally between guests. This new feature should solve issues especially for WiFi networks deployed in hotels where the WiFi users experience is significant. Why not allow unused bandwidth to be shared among active users? In the five guest example, where each is limited to 2 mbps, if only 2 are active, let them split the excess 6, giving each 5.